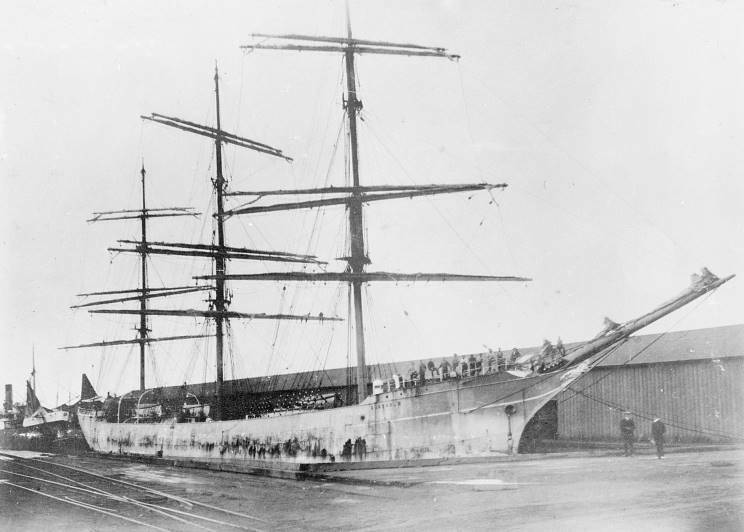 On June 24, 1896 a three masted steel hull sailing ship was launched at A. Rodger & Company of Port Glasgow, the 266' long ship was christened by Miss Boughton-Leigh and named Glenholm. Crossing the worlds oceans for nineteen years, her end came at the end of a gun. On Jan. 3, 1915 the ship departed Chile bound for the U.K. with a twenty-eight man crew and at least one passenger, Captain Campbell's 17 year old daughter. When about 16 miles off Fastnet Rock SMS U-27 surfaced and ordered the ship to be abandoned. The lifeboats were lowered and all on board left the ship. The young miss Campbell taking with her a parrot and two other exotic birds she was bringing home from Chile. When the boats were clear Kapitänleutnant Bernd Wegener opened fire with his deck gun firing between 35 and 40 rounds at the ship. The 1,896 ton Glenholm, ripped apart with shell fire, sank beneath the waves alone, no lives were lost. Captain Campbell later stated that the U-boat crew did not offer any assistance to the survivors and indeed even laughed at them as if the Germans were enjoying the plight of those in the boats. He even claimed that Wegener fired a shot over the lifeboats, in an attempt to "frighten them off" because they waited to see their ship go under. Q-ship HMS Baralong. Unlike Wegener who perhaps fired a shot over the survivors, in this case of the British pot being just as black as the German kettle, the Germans to a man, were machine-gunned in the water by the British crew in what became known as the Baralong Incident. Glenholm, date and location unknown.